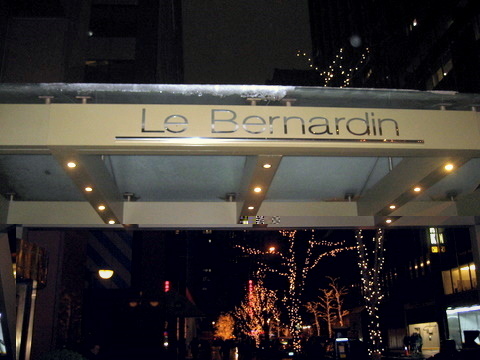 The first stop on the Michelin 3-star tour is Le Bernardin. Located in a random office building the restaurant has its name on the awning above the entrance. 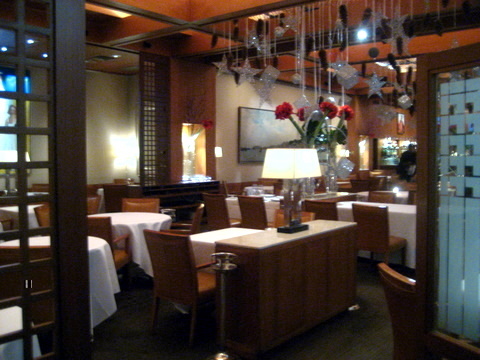 Inside there is a comfortable waiting area and bar with a fairly large dining area. 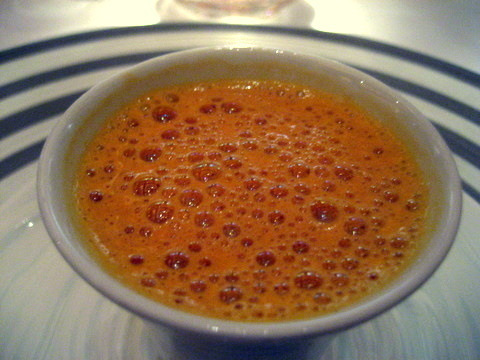 The soup was actually more of a chowder or bisque, with the sweetness of the lobster apparent early and the celery only coming on strong at the finish. 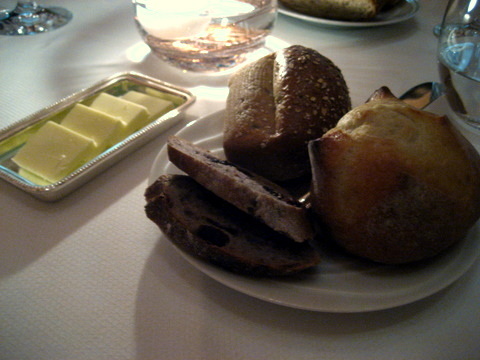 A fairly wide selection of breads with my favorite being the sweet roll. 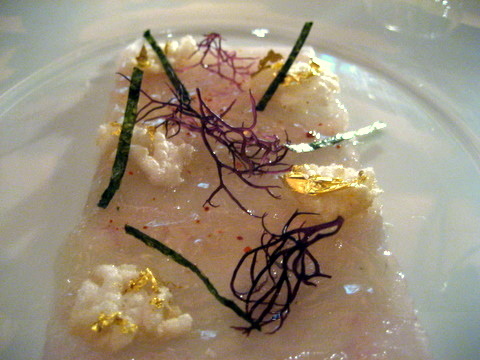 Le Bernardin Tasting Menu 01: Fluke - White Soy - Yuzu Marinated Fluke; Seaweed and Spiced "Rice Crispies"
The fluke had a delicate firmness that compared favorably to any I have had before. The use of two types of seaweed gave the dish a light refreshing flavor and the spiced rice crispy gave a nice textural contrast to the fish. 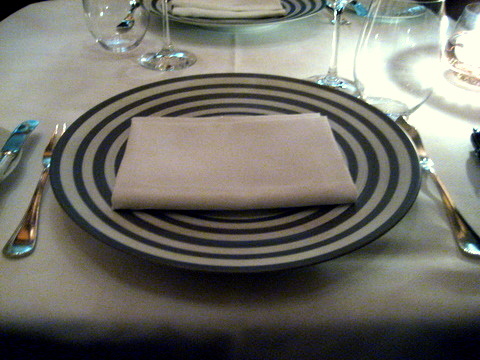 This was a beautiful presentation of a very traditional dish. 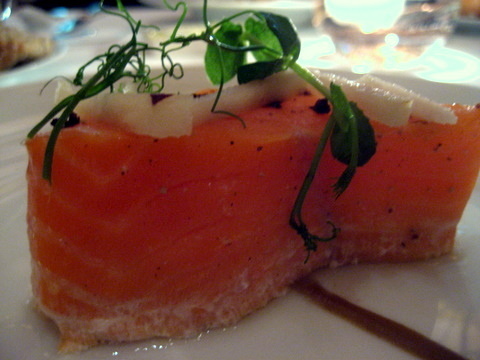 Both the smoked salmon and the caviar could have stood beautifully on their own. 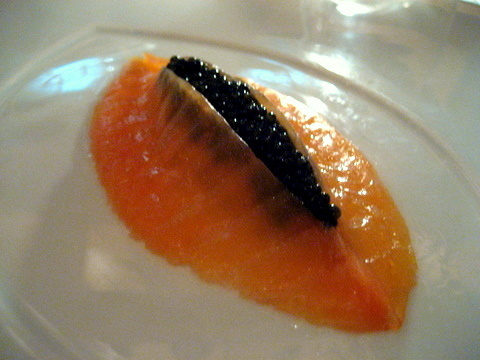 Combining the two, I actually thought the salmon was a bit overpowered and marginalized by the intensity of the caviar. One of the standouts of the night, the scallop is ever so slightly poached by the addition of the sake broth. Taken as a whole the dish has a distinctly Asian flavor to it. 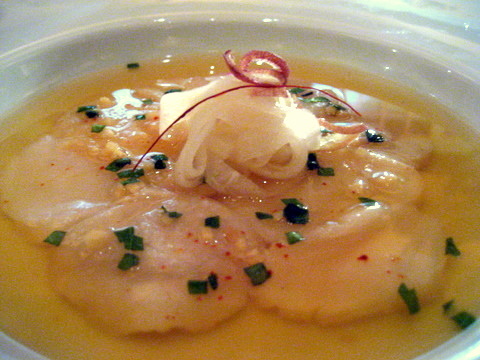 By themselves the scallops are slightly firm yet delicate, light in flavor they really absorb the tartness of the broth. The lily bulb reminded me of marinated daikon and the addition of ginger scallion and red onion helped round out the flavors of this dish. One of my favorites for the night. 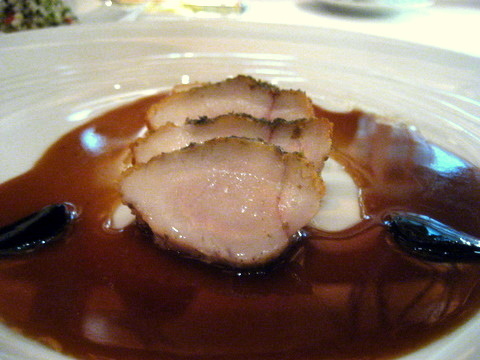 The flavor of this dish reminded me very much of the Amadai I had at Robuchon in Las Vegas. The use of olive and lemon added a tart, earthy aromatic element to the dish, serving as a nice foil for the natural oiliness of the fish. 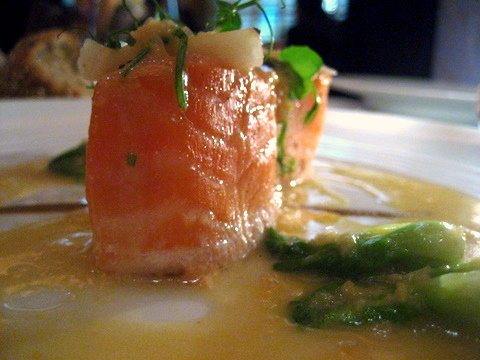 By cooking the salmon only on one side, the diner is treated to a gradual change in texture in each and every bite of the fish. The raw side was a bit soft for my taste, likely because of the warmth from cooking the other side. Despite that minor snag, the fish is the star here as it should be. Some of the finest calamari I have ever tasted. 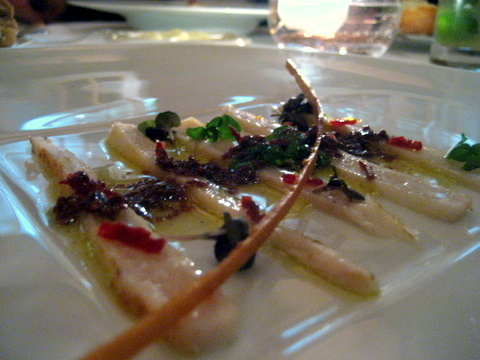 The squid itself was firm but had a slickness to it. The light flavor of the squid absolutely required the stuffing of prawns and mushrooms which had a very rich savoriness to it. 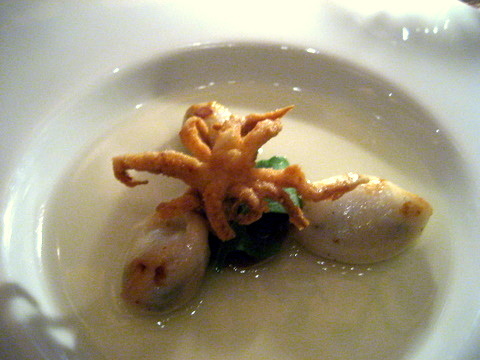 The squid legs were beautifully fried and crispy. 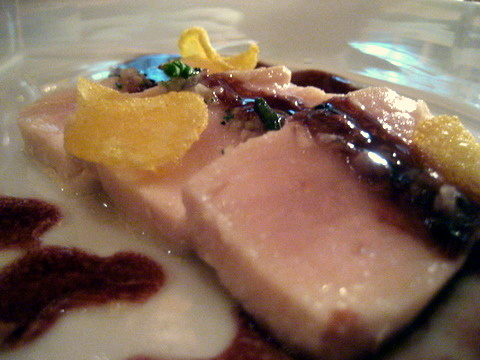 This had a chance to be one of the best courses of the night but the flavor was just a bit off. 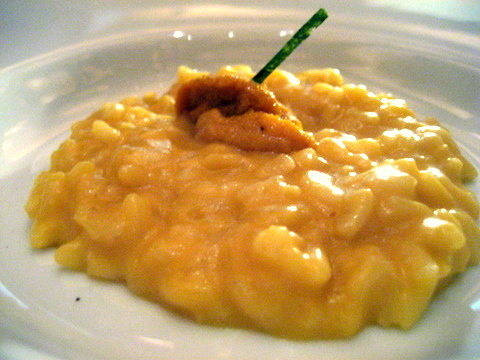 The sweetness and nutty character of the uni were abundant but the delicate brininess was nowhere to be found. The contrasting flavor offered by the brine would have helped balance the dish, instead it felt a bit too heavy for my tastes. 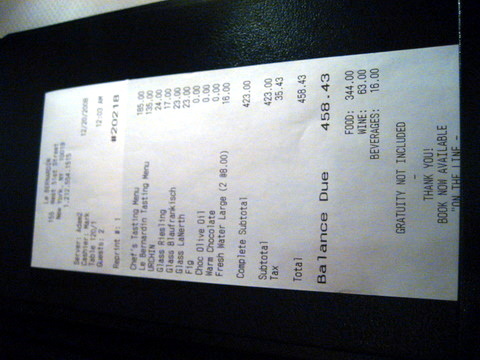 I had heard so much about the lobster here and how well it compared to the vaunted lobster at Laundry. 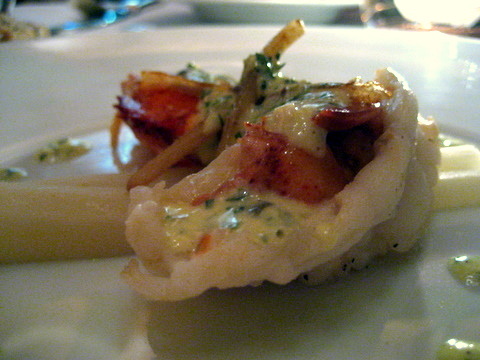 The lobster is indeed well prepared crisp and spry, even the claws, but it is not up to the standard at FL. The gribiche added a tartness to the lobster but I felt it was a bit strong, taking too much attention away from the natural sweetness of the meat. I thought the skate was done quite well, lightly browned on the outside but soft and moist inside, very little flavor by itself, the fish relied on the broth for most of the seasoning. With its spicy ginger and bamboo notes, the soup delivered on the flavor but I didn't feel it went all that well with the Skate. 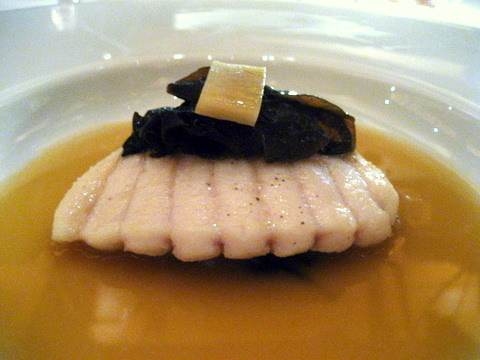 This is one of my first experiences with cooked Escolar. I have had it as a sushi a number of times on the east coast. As one would expect, the fish almost exudes oil. Very fatty and heavy the taste of the fish dominates and actually works very well with the light beans and potato crisps. 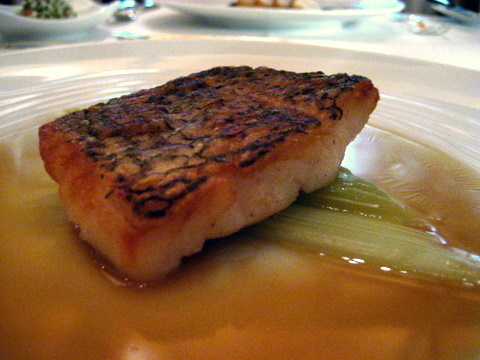 The fish was so flavorful it even stood up well to the red wine sauce. 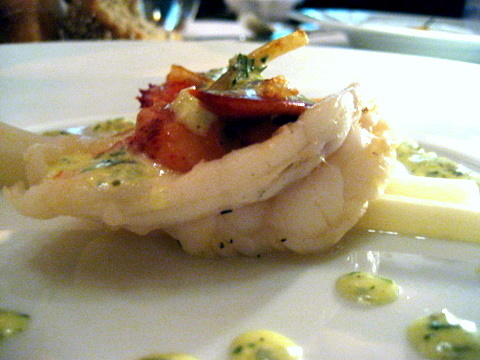 The monkfish had a dense firm texture. This was my first experience with black garlic which I thought was a bit sweeter than normal garlic but still could overpower the fish unless used sparingly. 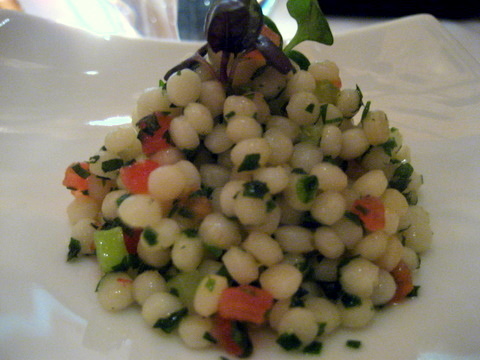 The tabbouleh came served as a side and added a refreshing zest that moderated the garlic and strengthened our tired palates. Wonderfully cooked fish, the skin was nice and crispy. 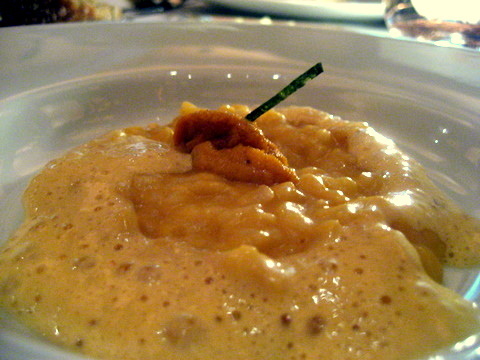 The ham and peppercorn sauce actually reminded me very much of a chicken stock. 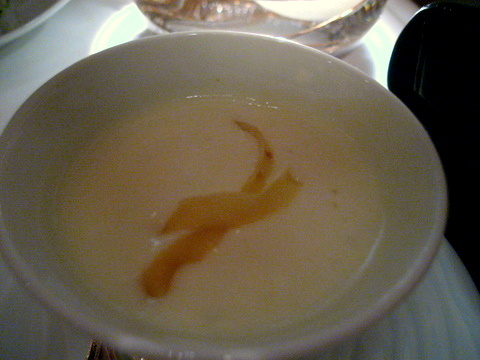 The parsnip custard was a touch sweet for my tastes and I felt the fish went best with just a bit of the stock. The panna cotta was a bit denser than normal and had the subtlest tang to it. 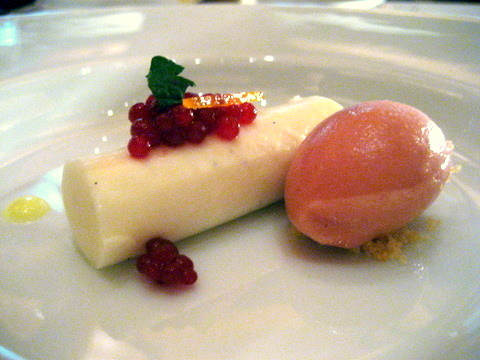 I loved the use of pomegranate pearls, small jammy bursts of flavor periodically enriching the panna cotta. 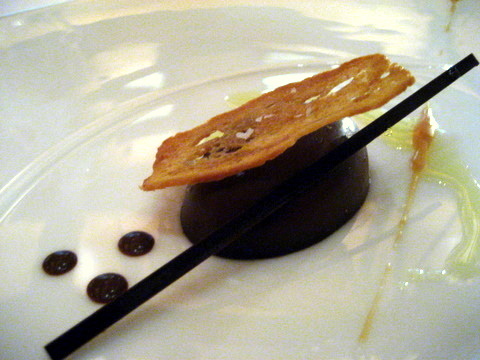 The goat cheese parfait was the most interesting part of this dessert. 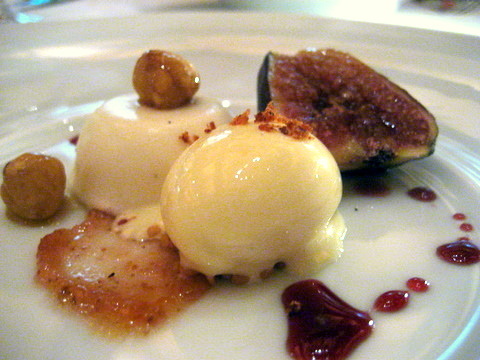 With its mild cheesiness, and bacon ice cream added savory elements that went nicely with the sticky sweet fig. 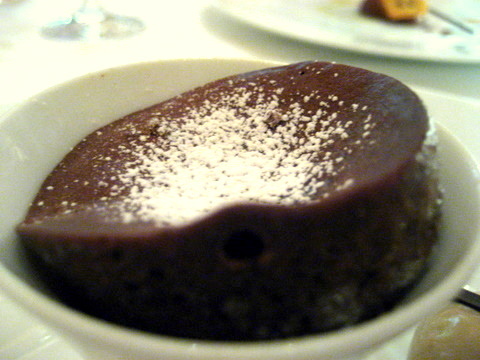 The chocolate lacked the subtle layers of flavor of the Ganache, as a result the cake was almost a bit boring. 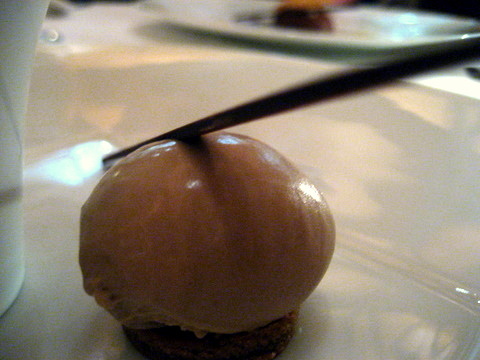 Here the ice cream has much more going on, with satisfying flavors of malt and rum. 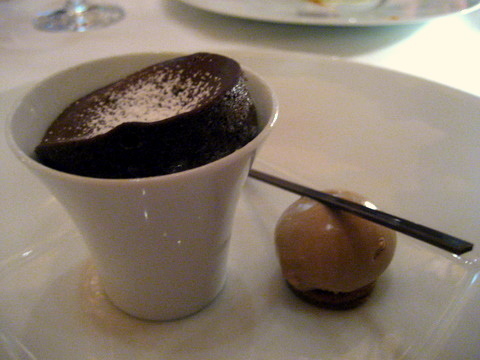 This reminded me very much of the Amedei dessert I had at Lola. I loved the overt citrus notes evident on the attack with this type of chocolate which evolve into bitter coffee notes on the finish. 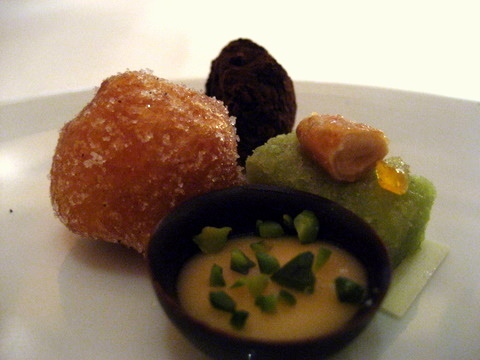 One of the most distinctive mignardises I have seen in a while. The vanilla filled beignet was very strong releasing an aromatic burst of warm vanilla when bitten. My favorite was the white chocolate cream in the dark chocolate cup with its initial creamy sweetness mixing perfectly with the dark chocolate and the pistachio. 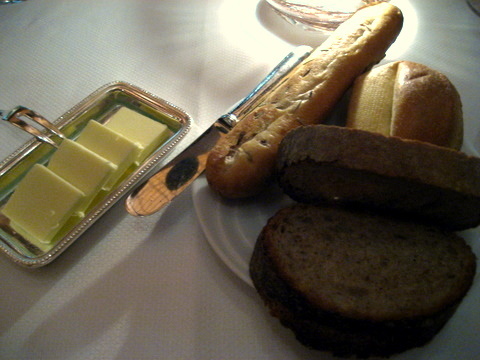 Much stronger than our previous dinner at Adour, the difference between 2 and 3 stars is quite apparent. 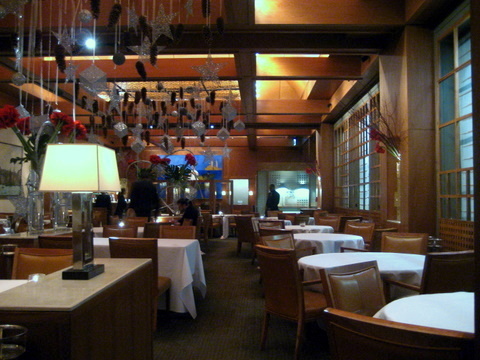 Although I wasn't as wowed by Le Bernardin as I have been by my two previous three star experiences, the restaurant still delivers beautifully prepared food. That has to be the sexiest food I have ever seen. Wants.